Apple Has Something for You to Touch March 7. Could it be the iPad 3? The curtains are just about ready to open and unveil a new Apple device to the masses. The rumor mills have been churning out plenty of iPad 3 seasoned gossip for the fanboys to chew on. Now those rumors are just about ready to be laid to rest as Apple has sent out invitations to a select tech oriented audience to attend a press event in San Fransisco. 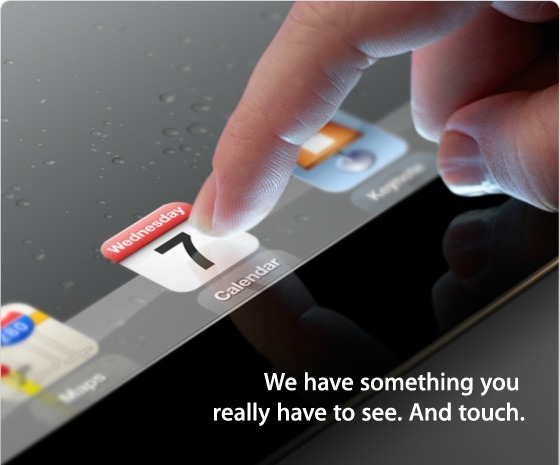 I guess we’ll find out when Apple unveils what it hints to be the iPad 3 on March 7. The event is to start at 10 AM PST (1 PM EST). So what do you think will become of this event? Will Apple actually show off the iPad 3 or will they pull something new out of their bag of tricks? Oh and we’ll be live blogging the happenings at the event so keep it here! Next Next post: Will Upgrading to “Windows 9” be Free?